The aftermarket will likely encounter a “tremendous use” of aluminum sheet on vehicle exteriors by early in the next decade, IHS Automotive forecaster Michael Robinet stressed Tuesday. “This is probably the most important trend that the aftermarket needs to understand,” Robinet told an Auto Care Association webinar. 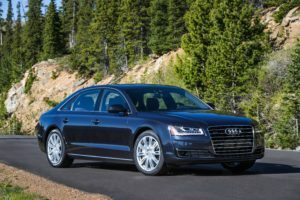 It won’t just be the novelty of an Audi A8 or Ford F-150 amid a fleet of steel cars, according to Robinet, the managing director of IHS’ global advisory practice. Closures and other exterior features like fenders will shift to aluminum by 2022-23, he predicted. “There’s more aluminum moving into the market,” Robinet said, and also more higher-strength steels. Fenders could even begin to shift towards carbon-fiber or other composites later in the next decade, he said. Robinet predicted anyone making adhesives or other fasteners allowing dissimilar or more heat-sensitive materials to be joined would be sitting pretty in the coming years. The only real hurdle should be developing a strong enough structure underneath to support the bed, according to Robinet. “That technology is still evolving,” he said. Asked why the Detroit Three weren’t using composites, Robinet suggested that could follow with next-generation American trucks. “There’s a lot of activity in domestic pickup trucks,” calling the shift to composite “very, very high” on U.S. OEMs’ list.